Please use this form for Facility Applications. 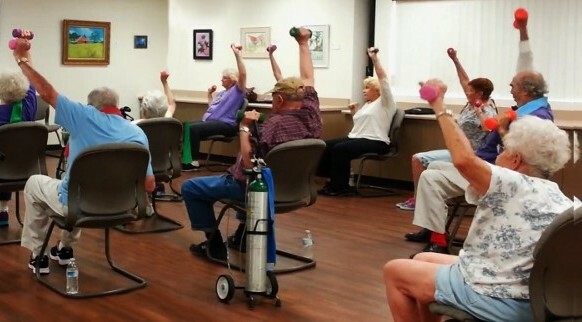 Geri-Fit® is an ideal evidence-based group strength training exercise program for any place that offer physical activity programs for older adults. No equipment is needed other than a set of light dumbbell weights ranging in size from 2 to 5-pounds and sturdy chairs. Facilities typically have dumbbell weights available for the participants to use, or the participants can bring their own weights to class. Licensing affords your facility the ability to offer a research-based, tried and proven, evidence-based strength training exercise program that's been thoroughly tested and used for over 25 years. This turnkey approach provides you with a step-by-step workout format so that you can expect the same program outcomes as published studies have shown. License fees for stand alone sites are a one-time fee of $2500 and includes training and certification for two instructors of your choosing. After the first year, there is an annual license renewal fee of $150 for each facility where Geri-Fit classes are held. There are no other fees, royalties or hidden costs. We also offer discounted program license fees for facilities with 10 or more locations (ask about our Blanket License option) as well as a Traveling License for facilities that are unable to offer year-round classes. We've prepared a Program Summary which will help answer any questions you may have about the Geri-Fit tier level III evidence-based health promotion / chronic disease management support program. Read some of these success letters from early adopters of Geri-Fit where it still being offered now 20 years later and with some of the same original members still attending class! North Olmsted and Streetsboro. This 2018 infograph shows some of the long term measurable outcomes that have been achieved with the Geri-Fit program. Title IIID Older Americans' Act (OAA) federal funding for Tier III evidence-based health promotion programs is available to facilities that qualify, especially senior centers and Area Agencies on Aging that are interested in implementing evidence-based health promotion programs or ongoing secondary support programs for chronic disease self-management as well as lifestyle change programs. Refer to the Title III-D OAA (Older Americans Act) cost chart by visiting the National Council on Aging's website or download the Cost Chart of the approved evidence-based health promotion programs (Geri-Fit is listed on page 18). Gathering info to share with your team before making a decision? View this short power point presentation for more information on how your senior center, AAA, YMCA, JCC, tribal organization, faith-based organization or non-profit can become licensed to offer the Geri-Fit program through OAA federal funding or other funding sources. Preparing your documents for funding? Here are some performance measures we suggest having done prior to starting the Geri-Fit program and again after the first 12 weeks. Do you need to replace your Bone Builders program with a tier III evidence-based program? We can train your existing group of volunteer exercise leaders in our award-winning accredited online training program, or we can fly to you and provide a one-day Master Trainer-led Geri-Fit certification! Looking at adding fall risk assessment tools that can measure the effectiveness of all your fall prevention programs or evidence-based health promotion programs? The BTrackS balance testing plate is an ideal performance measure to conduct on participants "before" they enroll in physical activity and "after" three months of continuous exercise. We suggest using it for not only the Geri-Fit program, but for all evidence-based programs, including fall prevention programs. The test takes only 3 minutes and it will track progress over time! Baseline balance testing is suggested for all adults that are over the age of 60 and an annual screening test should be done each year thereafter. Find out how you can make a difference in your community by offering the Geri-Fit® exercise program for older adults. If you'd like a formal quote, please fill out this Information Worksheet which will give us all the information we need in order to properly quote you. After the form is submitted, please allow up to 48-hours for a Geri-Fit representative to contact you. If you're just in the information gathering process and would like to schedule a call to discuss offering Geri-Fit at your facility / facilities, send us an instant text message by using our Contact Us link.